Camp Highlands is more than a camp. It’s an institution. 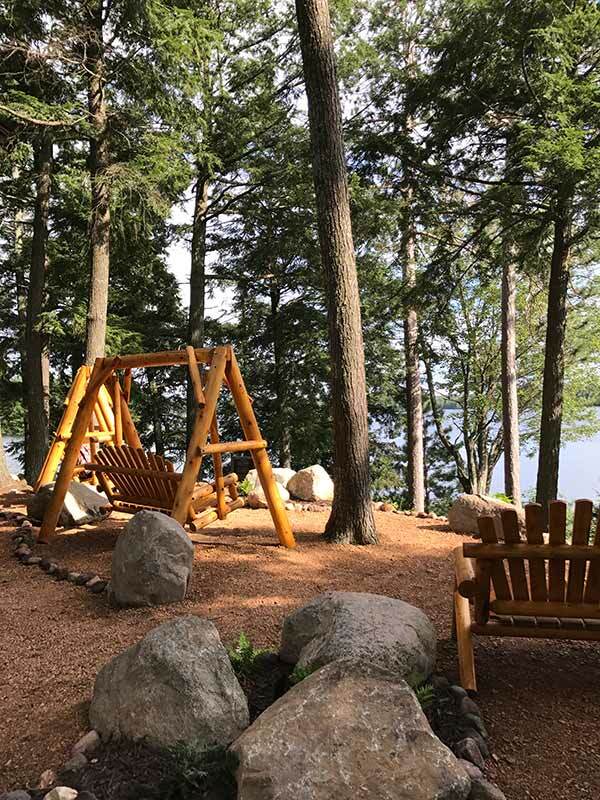 It was founded in 1904 by a University of Chicago lab-school principal charged with giving boys a “real wilderness experience.” For more than a century we have had the honor of watching boys grow and learn, struggle and persevere, play and explore. Boys throw balls on the same fields as Heisman trophy winners Jay Berwanger and Nile Kinnick. They paddle the same waters as Senator William Proxmire and Ambassador George Kennan. They perform on the same stage as playwright Archibold MacLeish and actor Bruce Dern. While we celebrate those great men of the past, we believe that every Highlands camper is capable of greatness. Did you know the Monilaw family hosted a scaled down version of Friends and Family in the 1930s and 40s? It was not promoted; it was just their friends and family, mainly from the Hyde Park and University of Chicago neighborhoods. This summer of 2017 Friends and Family was new and fresh. How fun, considering that this was the 50th F&F season (since 1968). Friends and Family has evolved, with alumni being the largest contingent. 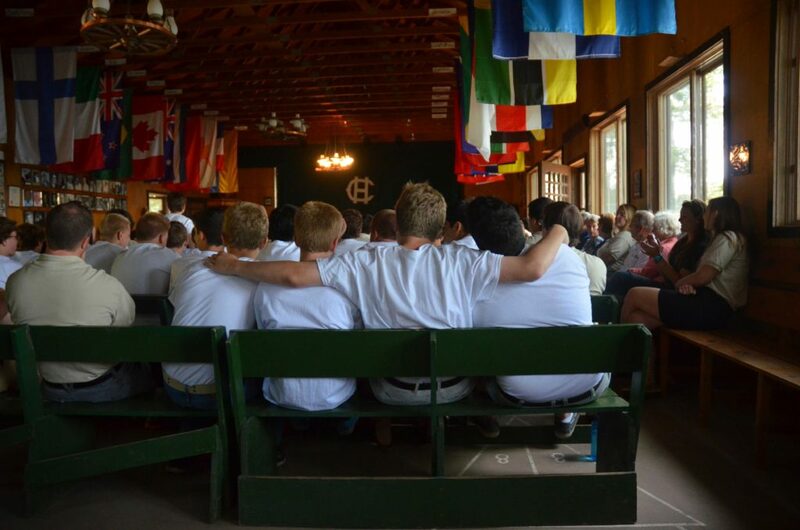 In fact, every boys’ camp cabin but three held an alumnus this summer. It was the largest ever showing and a harbinger of things to come. In addition to alumni, there were personal friends and ’perennials’. Several families with kids at an optimal age to get their “feet wet” in advance of boy’s camp or nearby girl’s camp joined in the fun. 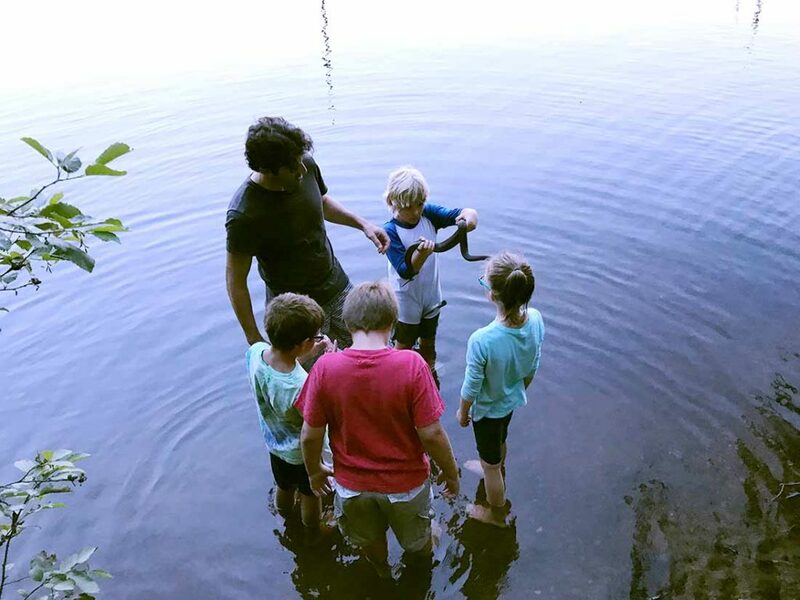 And boy did they get their feet wet, seeking out and holding in their curious young hands various snakes, frogs, toads, crawfish and salamanders. It was a fascinating phenomena, enhanced dearly by the generous and patient E.O. Wilson trained Harvard zoology major, and now wildlife painter, Brad Davis, an alumnus from the 1980/90s. After some coaching from Dr. Brad on where to obtain a particular creature, the kids consistently came up miraculously full handed. Brad would then hold court as professor, teaching all children (and drawn in adults) everything notable: how to hold it, its formal name, behavioral patterns, special adaptations, diet, habitat, and so forth. Perhaps the largest ever bullfrog was briefly coddled (one assumes to the dismay of the animal). But, before any lasting harm was done, the fun-to-hold-being was released with great care. One such student of Dr. Davis, a young Luke Keeley, was so enchanted by the cornucopia of wildlife, that he was compelled to ditch his family entirely, joining the Davis clan at all hours (except sleep) in constant pursuit of the ample fare! His parents both lamented and rejoiced in the abandonment as complete joy was found! For the rest of us more subdued nature lovers, there were record numbers of bald eagles, loons (six on the east end of Plum Lake alone), owls, woodpeckers, white tailed deer, turtles, butterflies and meteors. Meanwhile, others engaged more vacation like camp pursuits. Star Creek was up, and offered a deeper paddle than ever, before running into the inevitable downed trees and beaver dams. There were more barefoot water skiers than ever (at age 46, and 51!). It smacked of a ‘Staff Ski!’ if Shane Overbey hadn’t just had shoulder surgery, he would certainly have entertained us with some backwards barefoot. Next year, Shane! Some lounged on the raft and hung out at the all new Senior Pier and towers. It was the place to be as always during the warmer days. 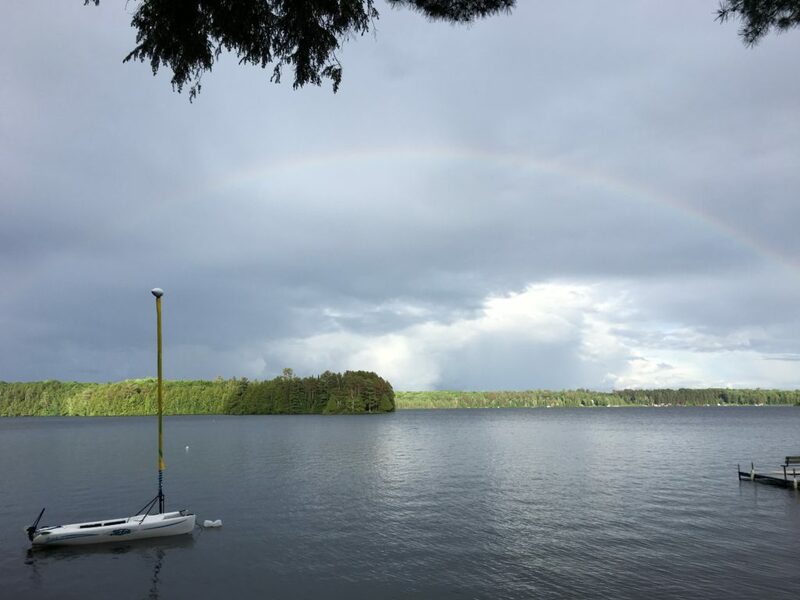 Sailing, kayaking, canoeing, golfing at Plum Lake Golf Club, tennis, archery, adventure, crafts, softball, frisbee golf, and Capture the Flag were all enjoyed as always. And for the first time, a Camp Highlands four-mile wilderness loop along the gorgeous shores of Star Lake was tramped, starting and finishing behind Freeland Field. Thanks to Jim DiDomenico and Brian Boos for blazing and marking this wonderful new trail with lovely CH trail makers. This loop is going to be a great addition to CH forever and ever! Wow! Hiking the 4-mile loop around Star Lake and Back Bay. For cooks night off, many descended on the Sayner Pub for its jovial north woods setting and famous pizza. Word had gotten out to the alumni whose families own summer cottages in the area, and for a moment there it could have been 1989. The establishment was wall to wall Highlands! What a reunion, and what a blast! There were a few very tolerable if not enjoyable stretches of rain – one of them, peacefully, at night. The other led to the offering of a rain hike on the east side of Star Lake, an adventure that entails hopping in a camp van and driving around Razorback and the northwest side of Star to get to the trailhead. The soft rain soon cleared and the wet, green forests enchanted, with spots of sun here and there. A pit stop at Stillwaters was enjoyed on the way home. Talk about relaxing! It was remarked, “I didn’t realize how much I needed this.” I believe that the moment one enters the indoors, that optimal natural flow begins to wain. Yes, it is not simply being in the wilderness that makes us feel good. We enjoyed not flooding our eyes with the blue light of the screen, and getting away from the workaday pursuits modern life demands of us. Highlands is not the Peninsula Hotel (although, camp lies on a peninsula) but is more relaxing than the Peninsula Hotel. For, only in the quietude of the wilderness can the human body regain its natural flow, and not just for an hour or two a day. 24 hours is best. During sleep, the thinner the layer between you and the outdoors, the greater the impact. So, we reveled in life as it should be. 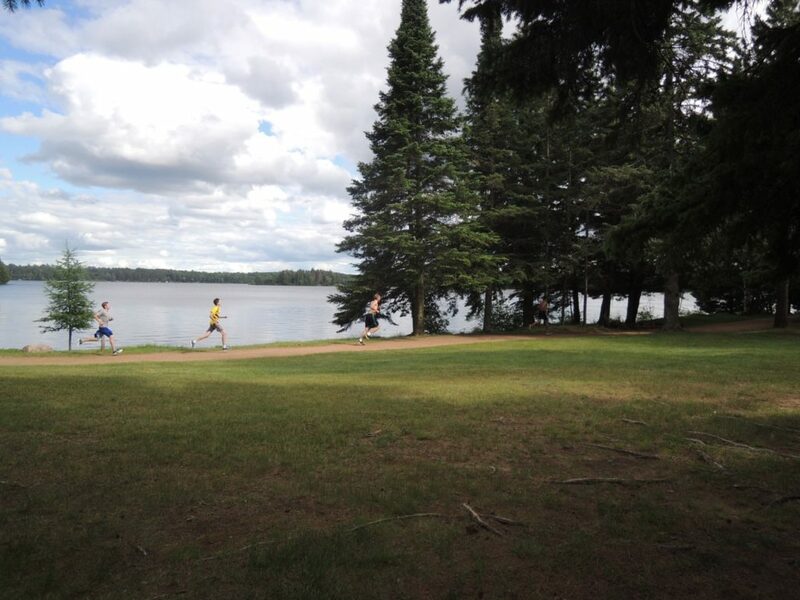 Immersed in the beauty of Plum Lake and Vilas County, we came down, fitfully at first. More and more each day, we napped and slept like buzzed out logs – not necessarily knowing who or where we were when we awoke! Yes, sleep can get very, very deep at camp. We turned our faces towards the sun and wind and water and woods and relaxed. Not at once, but gradually, those with the longest stays obtaining the deepest levels of revitalized health. Being in the lake itself, a refreshing curative. Am I sounding middle aged? I sure don’t feel like it when I’m swimming in Plum Lake! And so I found myself, after all had left Camp, still walking from Mom’s house down to Cabin 2 to sleep – like a wild dog. I had all of camp to myself. Eerie, you say? No, not at all. I love it. The cry of the loon; the black sky with a billion stars; the sound of the wind in the trees; and water lapping on the shore. These are the sights and sounds of eternity – something I’m not connected to as much anymore and that therefore are more valuable to me. I cherish them more than ever in this rapidly changing world. It’s September 7th, 2017: the 3rd anniversary of Dad’s passing. It seems hard to believe. We miss him so much. On the last day of boy’s camp, right before Banquet, Andy dedicated ‘Reflection Point’ as a place to remember him by. It is so nice there now – behind the clubhouse overlooking the lake – atop the hill. What a view. It was his favorite place to reflect on life – and what a life it was. The new swings and boulders and landscaping. It turned out so well. How pleased and grateful we are to have this place. It is directly connected to the Clubhouse and the fire pit below, the place where Harry Gillet first set foot on the property back in 1904. What a spot to be connected to the place so many have loved over the past 114 years and love today. The new Mike Bachmann reflection area is a great place to consider what it means to be a Worthwhile person. Hope to see you next summer! Mom, Andy, Carol, Lukas, and I will be waiting for you! You can save your spot now by filling out our online enrollment form. Please note that because of popular demand, we’ve created two sessions – first session (Saturday – Wednesday) and second session (Wednesday – Saturday) or join us for the full week! We took several great photos of you and your families. You can access those photos by going to the Camp Highlands Gallery and entering in the password: camphighlands – enjoy! A big thanks to Tim Bachmann for taking the helm as resident photographer! A special thanks to our wonderful staff. It was a beautiful contingent. The men and women that raise their hands to stay on for F&F are always, always THE BEST. 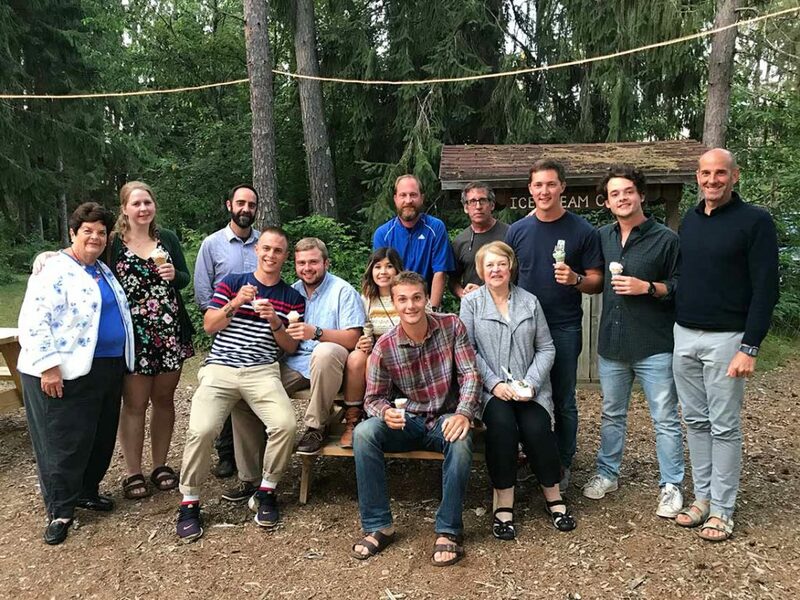 This summer was no exception, with David Kuesel, Shaun Trenholm, Johnny Zokovitch, Seth Fox, Tucker Nienhaus, Madi Kugler, Charlie Yokom, Ethan Williams, Matt Stepanich, and Phillip Seubert staying on to share the old place with us, and help us enjoy ourselves. Not cooking for a week! Because: Chef Lois Craig was joined by Carly Notorangelo, Natalie Trujillo, and Lex Smith. THANKS TO ALL OF YOU! Friendship, unplugged, fun, outside of our comfort zones, nature, becoming our best selves. This matters. I was recently talking with a father of one of our campers. He shared how his son was receiving a LOT of pressure to attend the summer clinics of his chosen sport. The coaches were holding out starting position offers like bait, and head-shaking shame if this boy chose a path different from the one they were suggesting. Fortunately for us, the boy (and family) didn’t take the bait. We have staff here who still remember when Division I athletes would come to Highlands. Our program director remembers how during free time, these athletes would pull out every heavy object at camp to haul around Senior Row. Meanwhile, they were also leading trips through the wilderness of the north woods; teaching boys the importance of hard work and perseverance in achieving one’s goals; and modeling for them the honor dignity of being a well-rounded human being. Not just an all-star athlete. And just like that, second term has started! Drop off was a bit damp, but you’ll be happy to know that today the skies are clear, the lake is gorgeous and the boys have a great northern Wisconsin day ahead of them. Today’s schedule includes safety talks in the various areas of camp and swim tests. After that’s complete, the guys will get to it with activities. The Instagram Story is a great way to get a quick taste of what’s going on around camp. But keep up! The clips disappear after 24 hours! We’ll start uploading photos to the gallery this evening, but in the meantime, don’t forget to check out the Instagram Story – it’s where we’re doing a lot of posting this year. You’ll love it. As a side note, Andy and I will be living out your reality, as we drop our middle daughter off at her camp this morning. I’m full of jitters – a mix of excitement and heartache – you guys might know a thing or two about that! Even after five years of going to camp, she gets excitedsadnervoussuperhappy on drop off day. This is one of those profound concepts that Michael Thompson talks about in his book, Homesick and Happy – the idea that we can have simultaneous conflicting emotions. You can be completely thrilled to be having an amazing time at camp AND also feel really sad missing your family. Can you tell I’m trying to talk myself into having the right attitude about today’s excitedsadnervoussuperhappy drop off? Happy Independence Day, we had an awesome time here at Camp Highlands yesterday. 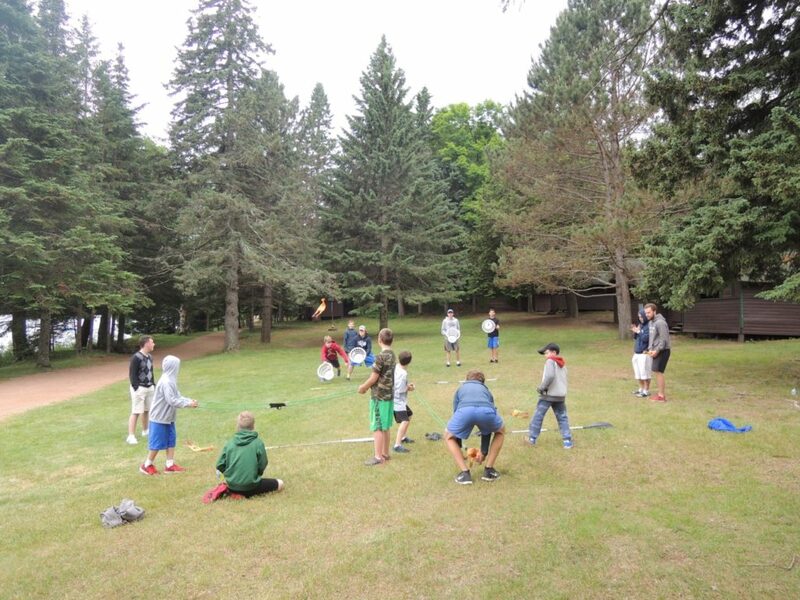 After lunch the individual divisions grouped up for their “Division Day.” Cubs took the busses into town to Jim Peck’s and pizza, Colts made PVC marshmallow-shooters, and Juniors and Seniors yutzed around camp, playing on a giant slip-and-slide and cooked out. The weather was wonderful. At 9, all of camp loaded up on busses to head into Sayner to watch the amazing fireworks show. Our caretaker also happens to be the fire chief and reserves a VIP location for Highlands every year. The boys reportedly hung out in “cuddly piles”! Ha! And did you check out this video of the eagle that was swooping around camp yesterday?! Amazing! Wednesday: Stunt Night…our infamously famous talent(less) show. 7:15 p.m.
Friday, July 7: Parents are invited to arrive at 3 p.m. to hang out, watch the football tournament, meet your child’s counselor and bunkmates. Please sign in at the water carnival or the office to get your name tag when you get to camp, thank you! Picnic supper is at 6 p.m. followed by our final banquet festivities which conclude around 8:30 p.m.
Cairns – not just a pile of rocks. Several cairns have popped up around camp. At it’s most basic, a cairn is a pile of stones. But cairns have meanings other than *just a pile of rocks. Cairns mark the trail for our guys hiking across Isle Royale right now. 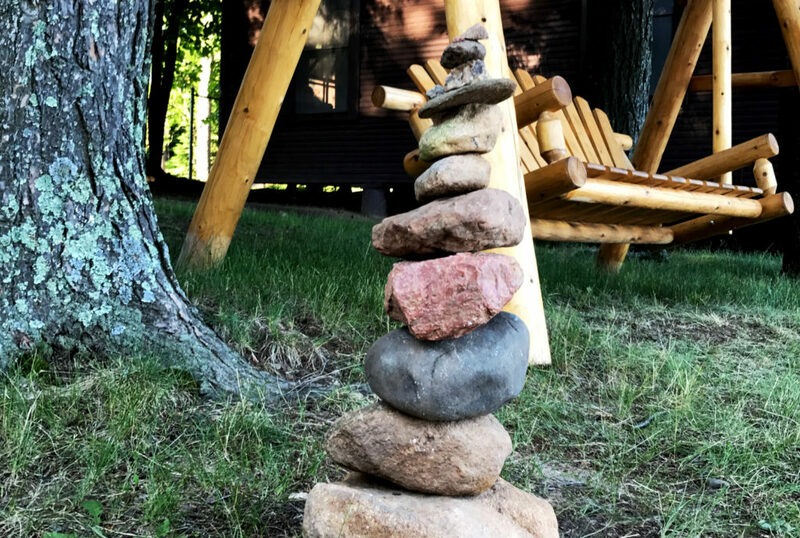 Cairns can be found on the beaches of Lake Superior, possibly denoting a place or a time of significance for somebody. And at last week’s Sunday assembly, I talked about how our honor camper qualities and our camp motto can serve as cairns or wayshowers for us in our time at Highlands—and beyond. Now, we’ve got all these rock piles around camp. Which I love. It’s a nice reminder that these guys aren’t just running around, tossing Frisbees and balls, paddling canoes and kayaks, sailing or skiing across the lake, or jumping in to the chilly waters for kicks. It shows that they’re also taking to heart the things that make camp so worthwhile. They’re recognizing that the words, “if he will, he can” aren’t just words; they’re goals accomplished, new friends made, new experiences tried. They’re building their own little way showers, using the stones of experience and opportunity to become a better, worthwhile, Highlands man. And they’re doing it all with a big ol’ grin on their faces. We’re heading into our last week of first term, if you can believe it! 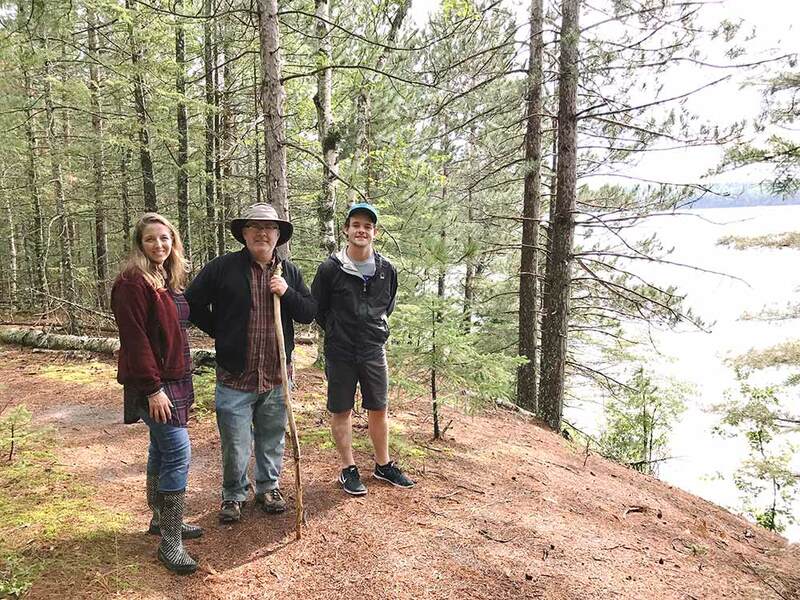 Our trippers start to return this weekend – the Seniors have been hiking on Isle Royale and Pictured Rocks, sailing on Lake Superior and canoeing in the Boundary Waters. Juniors have been hiking in the Porcupine Mountains and will all return by this afternoon. If your kid is anything like ours, trip stories will trickle out over the coming year – it’s one of my favorite things about Camp. Today’s theme day is Hobbit Day! The weather is gorgeous this morning – sunny, clear and calm. A great day for waterskiing. Tuesday night we’ll head into Sayner for the fireworks show, Wednesday night is Stunt Night, Thursday is the Kerchief Ceremony and then….we’re on to Friday and the final picnic and banquet! The track meet is almost as old as Camp Highlands itself. It’s a reminder of the early close ties to the Chicago Lab School and an emphasis on worthwhile pastimes such as track and field. 76 boys ran in the cross country race on Friday evening. S E V E N T Y – S I X B O Y S – over three quarters of camp ran in that race. Boys like *my kid who is not a runner (never has been) and RAN! I guarantee you, the lion’s share of boys who participated aren’t runners, but they took the initiative and showed up. Isn’t that what life is all about? Not being sure if you’re capable, but showing up anyway. I was proud of each and every boy who turned out for that race. The other cool thing about the decathlon is that it took up the. whole. day. Yep. We finished at 5 p.m. with an ARMY VICTORY, and were quickly ushered off to supper (Sloppy Joe’s) and then into the world-famous (no, really) Games on the Hill. Games were damp but fun and welcomed a NAVY VICTORY. So we’re all pretty much winning here, see? As you may have noticed, the weather has been kind of…meh. But these young men haven’t shied away from going for it. They’re learning, playing, paddling, tossing, batting and RUNNING toward life. Those are rubber chickens in sling shots being caught in baskets. Check out the Instagram Story for some action shots. So, this happened tonight! We’re taking it as a good omen for a great season! They made it to northern Wisconsin, Highlands friends! For those boys returning to camp for another summer, it’s like riding a bike. They chose their bunk, found their friends from last year and waited for the bugle to call them to supper and – VOILA – it’s like they never left. For first-time boys, it’s incredibly exciting, if not a little nerve-wracking (Which is OK – it’s just the first of many things to build confidence!) 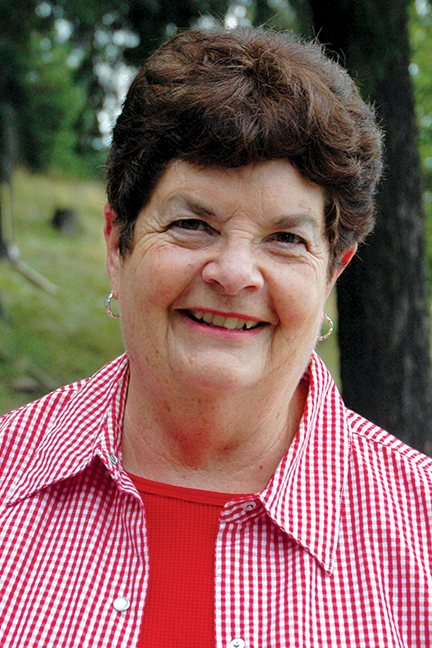 – if they rode the bus, they disembarked and were directed to their smiling counselors who sweep their trunks and gear off to their cabins where they’re met with more smiling faces (new friends!). 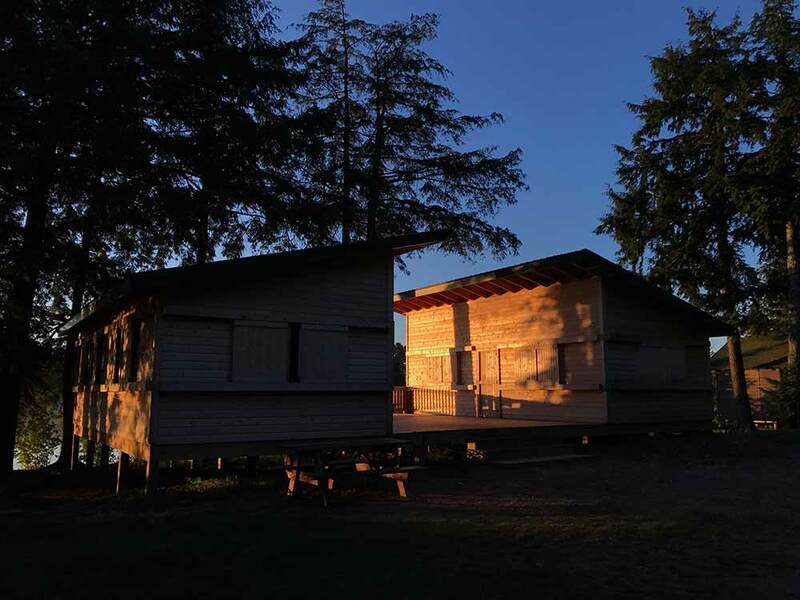 They chose their bunk, made their beds with their counselor and the bugle called at 18:00 when they headed off to the dining room and – VOILA – it’s like they’ve always been here. Spaghetti for 200, anyone? That’s what was for supper tonight. Can you imagine how many pounds of pasta that requires? Usually around 20 or so! Lois actually stirs the pasta with her special pasta canoe paddle (I’m not kidding!) which she keeps store in a secret location (so the CIT’s don’t use it to make bug juice, I’m told). The weather was a little indecisive tonight, but that didn’t stop the boys from getting tours of camp and hearing the basic ground rules. The damp weather is a stark contrast to the energy and excitement flowing through Highlands right now. The staff has spent the last week painting, trimming, cleaning, inflating balls, rigging boats…..and on and on. They’ve spent hours learning how to best instruct, guide and lead your boys during their time at camp. To say our staff is excited is an understatement. Thank you moms and dads, caregivers, grandparents and friends of camp for sharing your boys with us. We don’t take 114 years of Highlands lightly – we stand on the shoulders of many knowledgeable, kind, skilled, fun-loving and generous men and women. While humility is one of our camper qualities, we are very proud of the traditions and values that make Worthwhile men. 1-2-3…It’s 114 summers at Highlands! P.S. Keep an eye on the gallery. The password is in the Highlands Handbook, and in many of the emails I’ve sent you over the last few weeks.